The mainstream press played its part in perpetuating the Government's debt / money printing arm's (Bank of England) continuing inflation fraud with matter of fact coverage of today's CPI inflation rate holding steady at 2.7%. The reality is that the Inflation fraud is at the very core of why the general population is continually forced to work ever harder and to accumulate ever greater amounts of debt (slavery) all to just stand still in terms of being able to cope with the real cost of living increases that are NOT reflected by official CPI. The Bank of England for 20 years has perpetuated economic propaganda on the British people by way of targeting 2% CPI Inflation (accumulative), something that it has FAILED to achieve 97% of the time and this even during a period when Britain has been in an economic depression for FOUR YEARs, against which clueless academics and vested interests have been warning of the threat of deflation when in reality there never was any threat of deflation. During Britain's economic depression CPI Inflation has averaged 3.5%, RPI 4.2%, and Real Inflation has averaged 5.6% per annum. 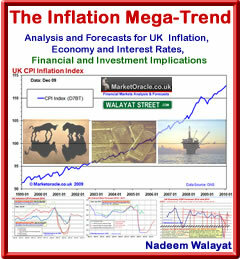 Whilst the mainstream press and academics WHOLLY focus on the annual CPI Inflation graphs, the reality is that of an exponential inflation mega-trend as illustrated by the below graph that better illustrates that despite the British economy having been in economic depression for the past 4 years, yet it has still suffered inflation of 15% and so called deflation was in fact a mere blip into mid 2009 as I warned at the time. There is No Debt Crisis! The truth is contrary to everything you hear that Britain does NOT have a Debt Crisis, instead it has ALWAYS had an INFLATION Crisis as the value of debt is always inflated away. The reason why there cannot be a debt crisis is because the government can always print more debt / money. Most people have been successfully brainwashed by relentless propaganda to believe that Inflation is good and deflation is bad. Inflation remains the primary mechanism for eroding away the value of the deficit and all debt that governments of all political parties utilise to buy voters with at each general election. Inflation is the primary mechanism that the Elite utilise in the ongoing transfer of wealth from workers towards themselves. This transfer of wealth manifests itself in the debt that ordinary people service and the value of assets that are leveraged to Inflation, as fractional reserve banking and Bank of England QE in large part benefits the elite by INFLATING asset prices far beyond the consumer Inflation rates for assets such as stocks, bonds, and property, as more than 50% of Britain's assets are held by the top 5%. If you want to protect your wealth then the only answer is to leverage yourself to the Inflation Mega-trend as covered at length in the Inflation Mega-trend ebook (FREE DOWNLOAD) that I seek to update as time permits on an ongoing basis. For instance ideally you want your income to be leveraged to inflation, such as in consistent dividend payment increasing stocks. My recent article explained in depth the dynamics of money printing Inflation fraud (03 Dec 2012 - Bank of England Cancels Britain's Debt, Coalition Government Budget Deficit Crisis is Pure Propaganda), which the below graphic illustrates why not only deflation is not possible but also why inflation will continue to surprise the clueless academics and pseudo economists that most of the population are exposed to courtesy of the the cycle of Government deficit spending, debt printing, Bank of England money printing debt monetization programme that is feeding the exponential Inflation Mega-trend. Contrary to what you hear from the academics and the mainstream press, there is no free lunch! Money and debt printing by the government to buy votes has a consequence and that consequence is Inflation. The government then TAXES you on the rise in wages purportedly to compensate for inflation which ensures that ordinary people who do not fully understand the nature of the fraud have no choice but to accumulate debt just to stand still because the government is effectively TAXING the INFLATION i.e. your wage increases CANNOT keep pace with real Inflation PLUS taxes, because there is no free lunch, government debt printing and fractional reserve banking money creation has to be paid for by someone and that someone is not the next generation but THIS generation as I have been warning for many years and as illustrated by the Inflation Mega-trend ebook (FREE DOWNLOAD). This is why despite working hard for all of ones lives many people still find that they have a mountain of debt outstanding, because it is not possible for most people to pay down the debt. The system IS designed to turn everyone and everything into debt slaves. It is much easier for Britain's savers to realise the ongoing inflation fraud because savings for several years now have failed to keep pace with even official inflation which the government then further TAXES at 20% and increasingly 40% as many more tax payers are being thrown into the higher tax bracket again due to a consequence of the INFLATION fraud. The system comprising of Inflation plus debt plus taxes plus the state education, exists to ensure total control over the general population by the elite that my next in-depth analysis will take a detailed look at. Ensure you remain subscribed to my always free newsletter to get this in your email in box as well as a series of scheduled detailed forecasts for financial markets for 2013. "as well as a series of scheduled detailed forecasts for financial markets for 2013." Thank you very much for offering this Nadeem. May I stretch my membership loyalty and ask for a rough draft of the schedule dates, or the first one at lest? I do my analysis in parallel rather than series, so likely it will be in a flood of articles in the last few days of the year. The markets will follow 2 more related to Inflation, with focus on Gold and Stocks before year end and possibily US Dollar but the timeframe is tight for that. Ive decided to complete and send out the Gold forecast first which should be posted Sunday/Monday.